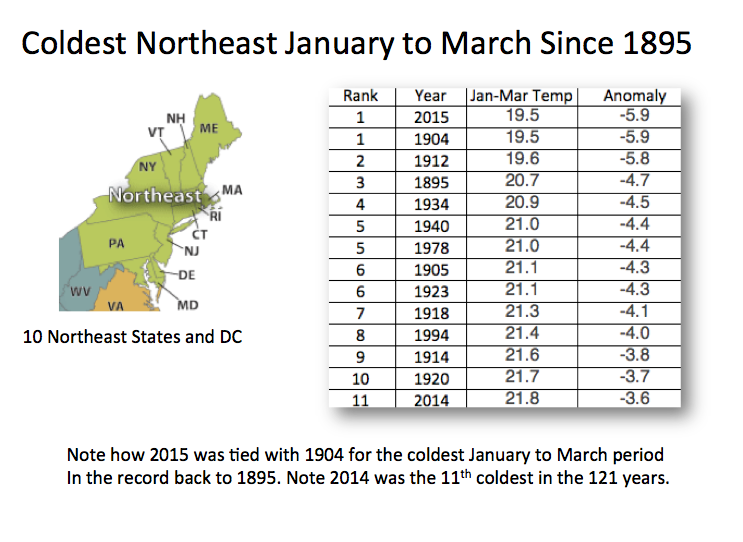 El Ninos always produce a global pop in temperatures. So expect that this next 6 months or so even in the only accurate data, from satellites. 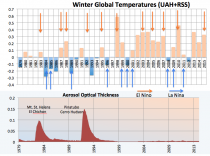 Strong El Ninos usually are followed by a pendulum like strong La Nina with a cooling. Major volcanoes can override or diminish any warming as El Chicon and Mt. St. Helens did in the early to mid 1980s and Pinatubo/Cerro Hudson did in the early to mid 1990s. 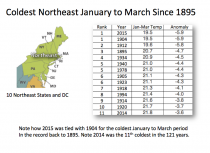 As we have written after the coldest January to March for the northeastern United States (10 states plus DC), and a cooling of 3F for the last 20 years in winters, you may not want to hear what solar scientists are telling us. “Our planet is just 15 years from a new ‘mini ice age’ that could cause extremely cold winters characterized by the freezing of normally ice-free rivers as well as by year-round snow fields in areas that have never witnessed such climate conditions before, a group of astrophysicists claim. The study findings were presented at the National Astronomy Meeting on July 9 and published in the Royal Astronomical Society papers. 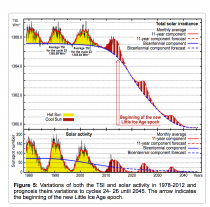 Their new model based suggests we will see the conditions last experienced during what was called the Maunder minimum, 370 years ago. 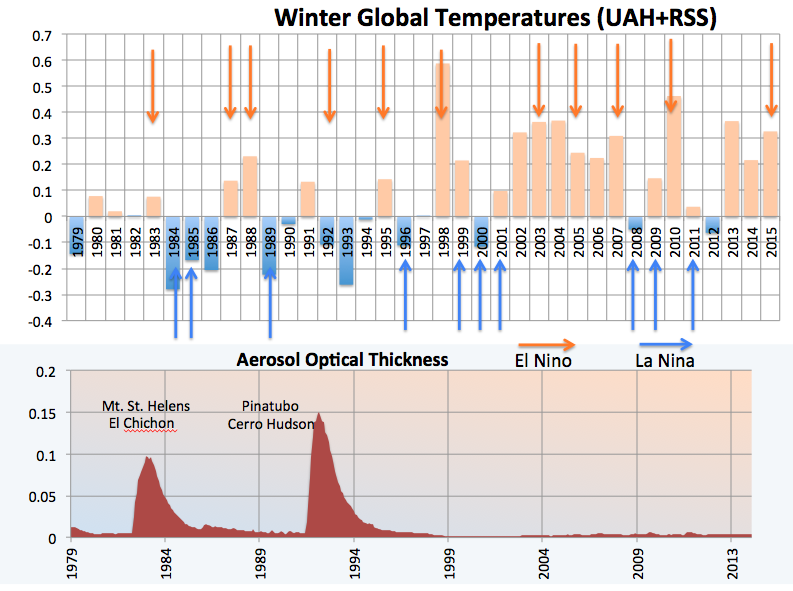 Australian Scientist, Dr. David Evans remarked “As we head to the UN meeting in Paris 2015 where global bureaucracy beckons, a sharp cooling change appears to be developing and set to hit in the next five years. Yet consortia of five-star politicians are not preparing for climate change, only for global warming. Around the world a billion dollars a day is invested in renewable energy, largely with the hope of changing the weather. Given that 20% of the world does not even have access to electricity, history books may marvel at how screwed priorities...of ‘bureaucratized science’ were”. Do I believe it? Yes! When I taught in college in the cold late 1970s, I had a panel in the second Northeast Storm Conference (now in its 41st year) on factors in climate. 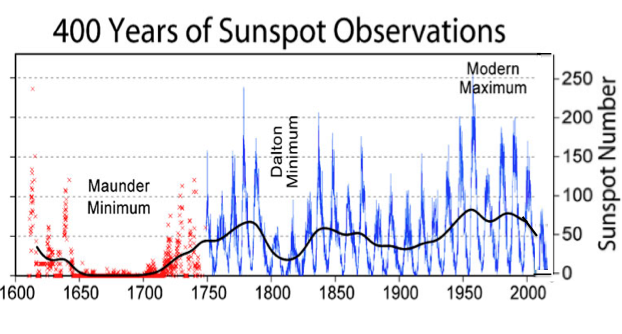 The panel included MIT’s Hurd ‘Doc’ Willett, who showed how the sun’s cycles (22 years, 180-200 years and others) affected the climate. He predicted then a cool down starting in the 1990s. 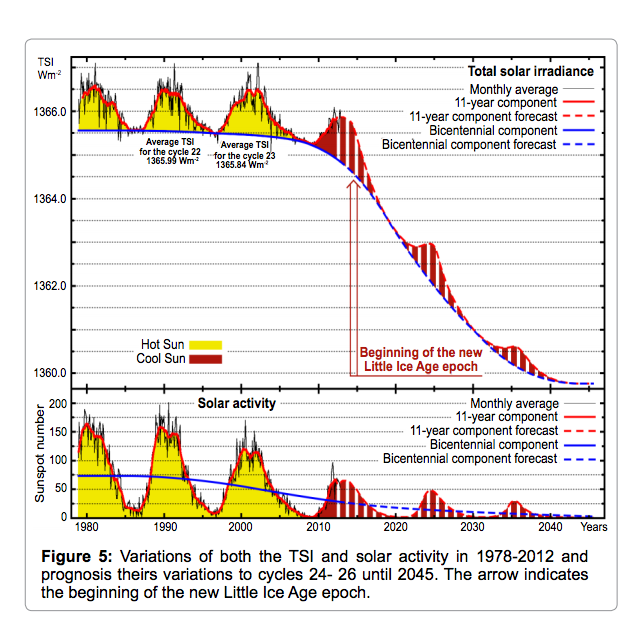 I have published peer reviewed papers that showed how though the sun’s detectable brightness (called irradiance) only changed 0.1% over most 11 year cycles, there were amplifying factors that greatly increased the sun’s affect on climate on decadal and century scales (everyone recognizes earth sun orbital parameters affect our days, seasons and the longer term cycles of glaciation it is all the other time frames that try to ignore). These amplifiers include ultraviolet radiation that varies 6 to 8% in the 11 year cycle and produces heat from ozone chemistry in the high atmosphere in low and middle latitudes, geomagnetic activity that causes the ionization heating and displays called the ‘aurora’ and also the solar wind modulated galactic cosmic rays that affect the amount of cloudiness (and through that, solar heating) we experience. 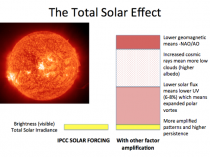 All of these have been shown from empirical evidence to produce more warming when the sun is active and less when it is quiet. So what remedy should we pursue? I turn again to Dr. Abdussamatov who I met over a year ago in a Las Vegas climate convention. There was the language barrier, but he spoke enough English and I did have some Russian coursework in high school and college so we did understand each other. Given that cooling produces more mortality and suffering than warming, we should take this seriously and push back at efforts to drastically disrupt our energy solutions to combat a failing prophecy that politicians, our universities and the compliant media have been indoctrinating our children and the masses on for two decades.